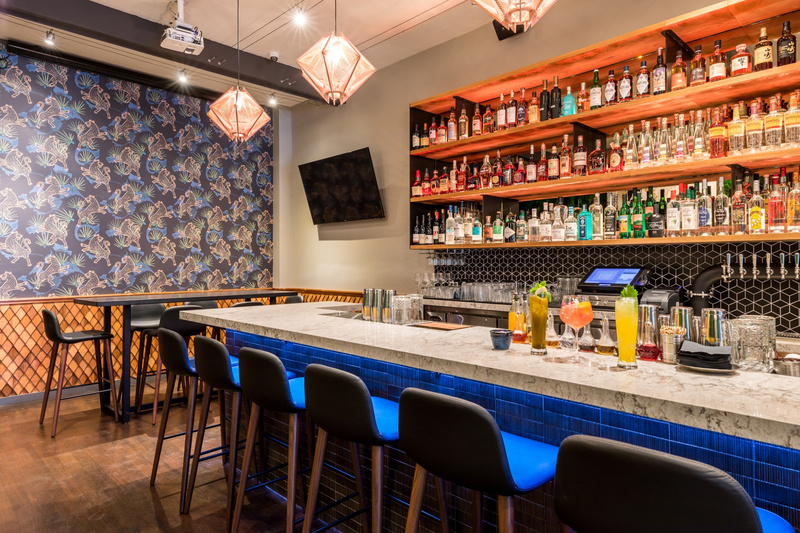 Open in San Francisco since 2018, KAIYŌ is a celebration of immigration, exploring the blending cultural cuisines of Peru and Japan. Overseen by owner John Park, and design consultant Hannah Collins, KAIYŌ’s interior design blends contemporary decor with accents of natural elements, art and pops of color. The team created a cohesive feel to the space by dressing every wall in visually engaging, yet different textures. The main focal piece, a 35-foot-long naturally preserved moss wall created by Planted Designs, is offset with two large street-art style canvas paintings, commissioned exclusively for KAIYŌ, picturing elegant, Japanese women in traditional dress by artist Miss M (@Missmtoyz). A sleek marble bar top runs along the heart of the restaurant, illuminated by handmade lanterns crafted by Parisian lighting artist Julie Lansom, while the back wall features a handmade wooden shingle sub wall set below eye-catching, golden leopard wall paper. The floating bar shelve system, installed to highlight KAIYŌ’s Japanese Whisky and Pisco spirit collection, is offset with bronzed mirrors. Attention to detail was paid to all areas of the restaurant.The two bathrooms are art installations themselves, featuring street-art murals commissioned by local artist Lisa Pisa (@mspisa), telling the tale of her Japanese friend Satsuki and Satsuki’s grandmother. The first restroom depicts Satsuki’s life in Osaka, Japan, and her visit to Lima, Peru, following her grandmother’s passing. The second restroom depicts Satsuki’s journey in Lima, how she discovers KAIYŌ, and draws inspiration from Nikkei cuisine to take over her grandmother’s restaurant in Japan. Modern Restaurant Management (MRM) magazine asked Park to elaborate more on what went into created this work-of-art restaurant. How long was it from ideation to realization? I had an idea for KAIYŌ’s concept, then made some adjustments so that the concept could fit the neighborhood, location, and infrastructure of the restaurant. Overall it was a relatively a quick implementation. From purchasing the previous restaurant space, to finishing constructions, it was approximately one year. What was the ambience you set out to create? 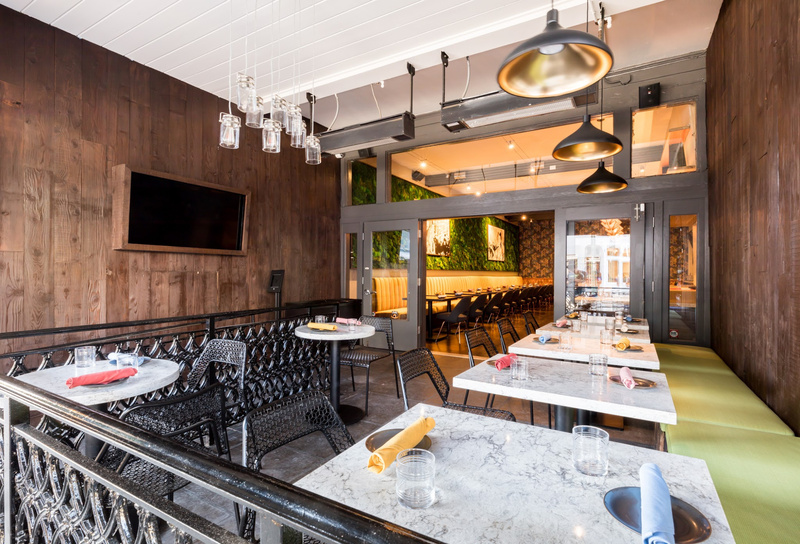 An elevated social dining experience without being too stuffy. What was the most challenging part of completing the design? Integration of art was challenging. It was challenging to have artists understand your vision without asking them to deviate too much from their style and creativity. KAIYŌ’s bathroom mural is definitely my favorite design element of the restaurant. The custom anime mural installation is not only visually appealing, but tells a story that connects our food concept thru the art. What are the unique challenges to incorporating natural aspects to design such as your moss wall? Adding a natural and living element to your restaurant is always visually appealing, but when it’s as prominent as KAIYŌ’s, you need to be confident the feel of the restaurant is not being compromised from your original vision before the installation happens. How important was texture to the design selections? Texture was very important to creating visually interesting walls and surfaces without making it look too busy. One of KAIYŌ ’s most interesting texture paneling was the shingle wood wall panel. The shingles were laid out to mimic a fish scale which connects our food concept. Why was it important to create the right tone with the bathroom designs? We felt that providing a well-designed bathroom tells guests that the restaurant cares about details. Restroom design and details are often ignored other than the basic necessities. 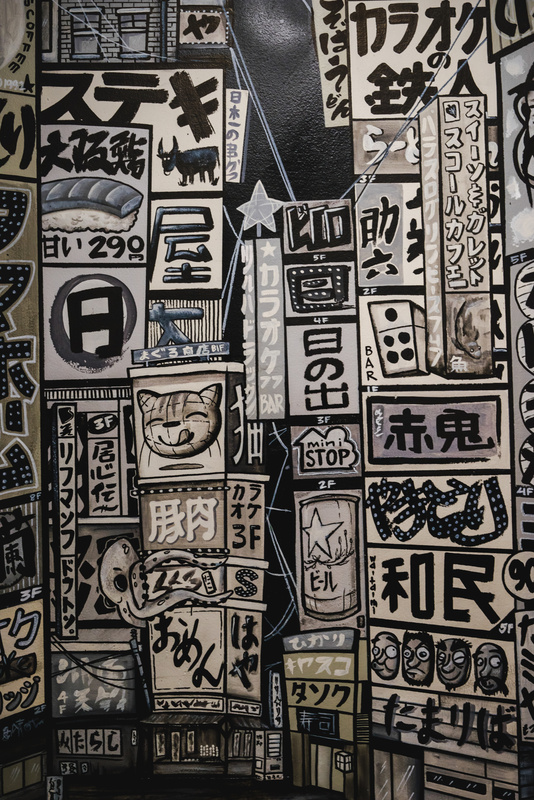 When guests enter KAIYŌ ’s restrooms, they are often shocked to see the detailed art. I always view art in an unexpected place as a great opportunity to make a lasting impression. How does the design pair with or reflect the menu? KAIYŌ ’s design relates to the blending of Peruvian and Japanese cultures; what Nikkei cuisine represents. We took inspiration from each culture with the anime art install in the restroom, leopard wall paper that feels like the Amazon rainforest, fish scale shingle wood wall, and hand-woven Japanese lanterns. What response have you received from guests? We often receive compliments from guests for the design of the space, but the real compliments are given when guests ask detailed questions about certain design elements of KAIYŌ. “Is that moss real? How do you keep it alive?” or “Is Satsuki (character in the bathroom mural) a real person? Who painted your restroom art?” I personally love telling the inspiration and story behind each design installation.